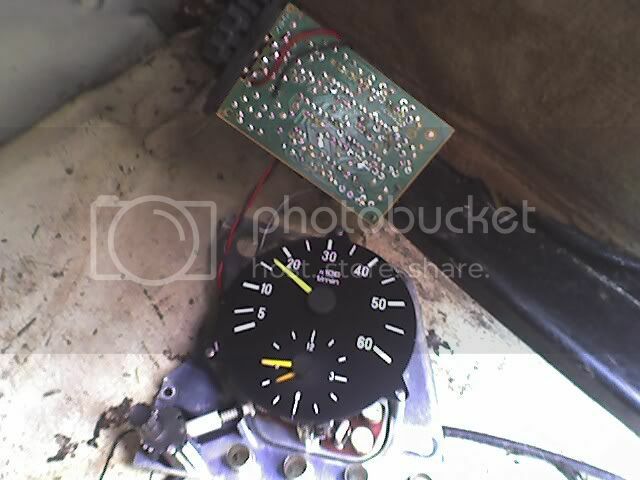 Pic above is the tach from my 300D Turbo soldered to the EGR controller of my 240D, with engine reved to 1500 rpm. The EGR controller on the 240D has built in circuitry to measure rpm and afaict has the same circuitry as in the tach amp. All I had to do was supply switched +12V and ground to the tach (from the EGR in the pic) and run a wire from pin 12 of the LM1815 on the EGR controller to the tach and that's it! My tach has a 2 terminal connector, one is switched +12V, the other goes to pin 12 of LM1815 (to tach amp on the 300DT), ground goes the the tach's metal mounting plate. In the final install, I will run just one wire from the EGR controller (pin 12 LM1815) to the tach and pickup ground and switched +12V from the cluster. This was very easy but not without pain. In figuring out wiring to the tach, I had the cluster removed and had just the tach connected on the 300D and ran the engine to meausure the tach with a DVM. I forgot the oil pressure gauge line was open! You wouldn't believe how much mess a little bit of black oil can make. Most of it landed on my pants. duh!. I shut the engine off real fast. I mopped it up and no damage was done other than to a quarter size spot on the carpet which is junk anyway. Now I will have a tach in my 240D yea! I love driving it with the 4 spd. I am getting 32 mpg around town which is much better than my 300DT.